Traton Homes, one of metro Atlanta’s oldest and most innovative homebuilding companies, will soon be building in an exciting new, walkable townhome community in downtown Kennesaw, Ga. The Village of Fuller’s Chase will include 22 three-story townhomes with open floor plans and two-car garages priced from the low to mid $300,000s. 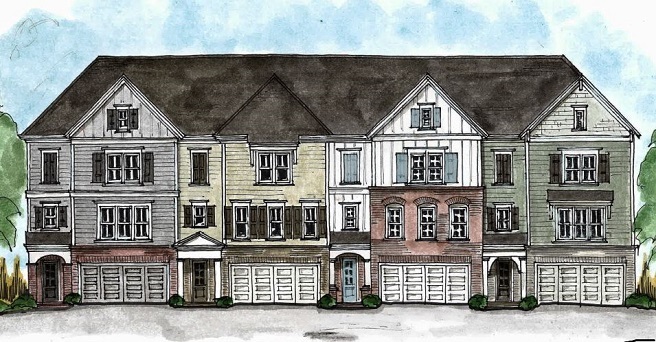 Townhomes at The Village of Fullers Chase will feature 3 bedrooms, 3.5 baths and a 2-car garage. Highlights of these homes will include a finished terrace level with guest bedroom and full bath, a spacious open main level with gourmet island kitchen, and an upper level owner’s suite with large walk-in closet and luxurious bath. The main level back deck and optional second deck off the upper level will be perfect for relaxing and entertaining. Homes will be available for sale this fall. “The Village of Fuller’s Chase is designed for residents to fully enjoy the many lifestyle amenities available in and near the City of Kennesaw,” said Kimberly Garwood, director of marketing for Traton Homes. “Located in the eclectic downtown district, our community is designed so that residents can leave their cars in their garage and walk to restaurants, concerts, farmer’s markets, and special events like the annual Pre- Independence Day Salute and Taste of Kennesaw.” In conjunction with Kennesaw’s Depot Park master plan project, a multi-use path will connect The Village of Fuller’s Chase to the downtown park amenities. Kennesaw, Ga. is known for its small-town charm and big-city amenities. Over its nearly 150-year history, Kennesaw has retained its historic, small-town feel, even as it welcomes new residents, businesses, schools, healthcare facilities, and much more. With close proximity to I-75, homeowners will enjoy easy access to area destinations and work districts such as Town Center Mall, Kennesaw State University and Wellstar Kennestone Hospital. Its convenient location just northwest of Atlanta makes it ideal for those who seek the ambience of small-town living with proximity to a major metropolis. Visit Traton’s website to join the VIP List and be among the first to learn more about this exciting new walkable townhome community.